After their chores are finished many Amish enjoy a game of croquet and so can you with this handcrafted croquet set. Each set contains hardwood maple mallets which are lathe-turned and hand painted in sectioned rings which match the colors of their corresponding balls. 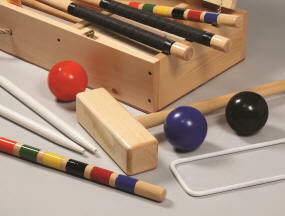 The maple mallets have a mallet head of 9-1/8" long x 2-1/8" diameter. 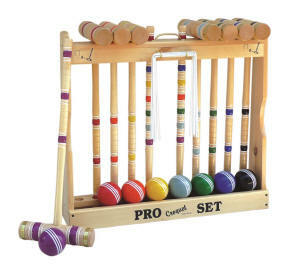 The standard handle/mallet is 25.5" long from bottom of head to top of handle. You have the option to add 4" or 8" to each handle which gives an overall length of 29.75" and 33.5" respectively. Two rings of polished brass adorn each end of the mallet head. The two(2) stakes are lathe-turned with multi-colored sections. 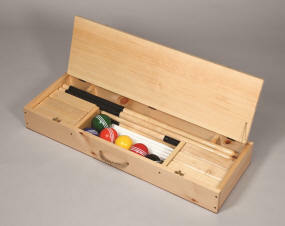 The nine(9) 5/32" diameter vinyl-coated metal wickets are very substantial. 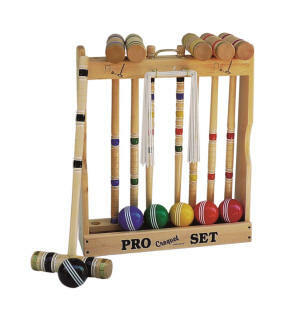 The balls are made from a plastic polymer and are 3-5/16" in diameter. 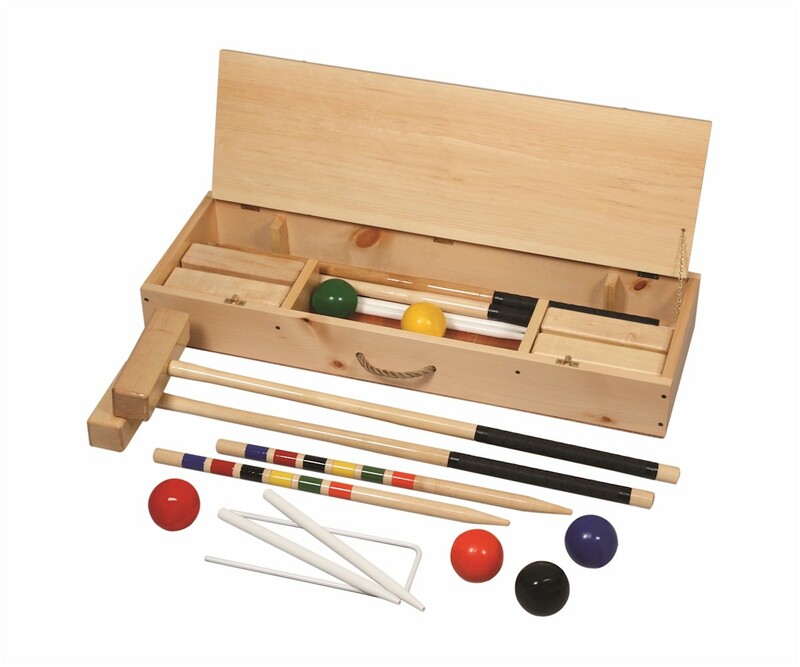 Each croquet set comes with a handmade wooden storage rack or a canvas-like carrying bag. (Carrying Bag is also sold separately). Holds either 6 or 8-player sets. 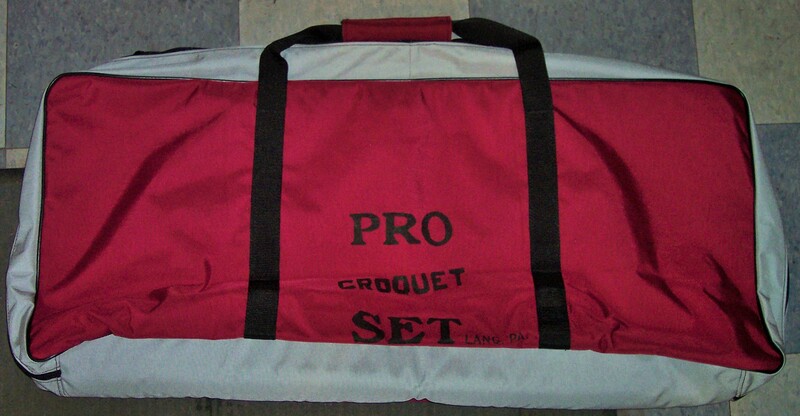 If you ordered your croquet set with the handmade wooden storage rack, a canvas-like carrying bag made using a waterproof vinyl material with a durable handle is an option. Holds either 6 or 8-player sets. Lost a Ball or Need an Extra? Specify ball(s) color(s) in the comment box which appears during the checkout process.